Recently I read one very interesting and useful e-book related to Search Engine Optimization. This really help me to learn a lot of concept about SEO. And also the tips are very useful to increase search engine ranking of your website. So here I am sharing the content of that e-book with you all. 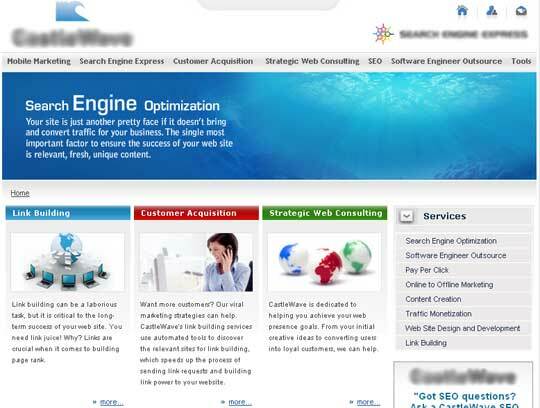 Hopefully this will also help you to increase your knowledge in Search Engine Optimization. This is the Part 1 of 4 articles – Content Is King. The single most important factor to ensure success on your website is unique content. Content must also be fresh and relevant for each category page. We cannot stress enough the importance for this type of content in order to garner search traffic. Nothing is more critical in achieving solid organic and paid traffic. Your content, coupled with the keywords your customers are searching for on your product, should tell your customers what you want them to know about your product. Your content should engage your readers! Ideally, content for main category should contain between 250 – 500 words. If it is more than that take the opportunity to break the content out into a “next” page. Over 500 words on one page is a choking point for the spider. Creating additional pages is an additional opportunity for indexing and linking. One of about.com’s secrets to success was to provide the content into bite sized morsels and multiple pages then ID different target words for each of the pages and cross link them. The end result was more pages for the spider to crawl and more indexed words, which resulted in more traffic. As inner pages under a given category are created the word content does not need to be as extensive. Content could only be 50 – 100 words. However, the descriptions must be unique, relevant, and fresh. The more unique, fresh, relevant content written on the page and via blogs, forums, fan clubs, social networks, and so forth about your site and the more deep links to it the more potential link power you have. Images named with relevant words and alt text tabs. These, coupled with the most critical element, content on the topic, are a powerful combination. Knowing what the spider sees when it encounters your web pages is critical. Following are simple steps for determining exactly what the spider sees upon encountering your pages. Go to the page you want to scrape. Select all by pressing Ctl A, copy the selection into a buffer with a Ctl C.
Open a text editor such as word pad – not a word processor. Copy contents into the text editor by pressing Ctl V.
Will the content in the text editor convey to the spider what the page is all about? Link building can be a laborious task…but it is critical to the long term success of your web site. You need link juice! Why? Links are crucial when it comes to building page rank. Want more customers? Our viral marketing strategies can help. CompanyName uses automated tools to discover the relevant sites for link building which speeds up the process of sending link requests to the other websites. initial creative ideas to converting users into loyal customers, we can help. Search Engine Optimization! You want search engines to find and feast on your site. Content is king but you better understand the importance of link building, how to structure your pages to accommodate search engines, and key html elements. Just because you have your page up doesn’t mean search engines will find it and know what it’s all about. Content Creation! Because content is so important you need to know how and where to use it. We build landing page content, blog, articles, product AdCopy and more. Link Juice! Links help drive traffic but not just any link will do. You need the right kind of links. Our insightful team understands how to build your link power. CompanyName will only participate in “white hat” linking practices and we employ automated tools to determine relevant sites for link building. Customer Acquisition! Want more customers? Our viral marketing strategies can help. Software Engineer Outsource! Now that you have the idea in your head, how do you make it a reality on the web? How do you create the application that will show the world your idea? Let us show you how! That’s ABOUT 500 words. Does the above content give the spider the clues it needs to know what this site is all about? One of the common mistakes site designers make is allowing menu structures to get in the way of content. Keep in mind that spiders will only crawl through approximately the first 250-500 words on a page. It is critical that your key message be clearly identifiable within this range. Content is king, not menus, not flash, not images. Structures set up using duplicate content will not have marked success with search engines. Be careful when using a sort function on the page or you may end up with duplicate content issues. You must be very careful in both giving and receiving standard, ubiquitous XML feed product descriptions as your content. Many eCommerce sites with the same distribution supply chain all get the same product descriptions. The spiders will see this duplicate content. Its best to keep content fresh and relevant. Avoid giving away your fresh content via XML feeds to anyone else. Make sure the spider credits you as the author of your content. Below are the steps you need to follow to ensure you get credit. There is great value in sending your content out via XML, just ensure the process is followed so other sites don’t get your credit. The more unique, fresh, relevant content written on the page and via blogs, forums, fan clubs and so forth about your site and the more deep links we get to it the more potential link power you have. 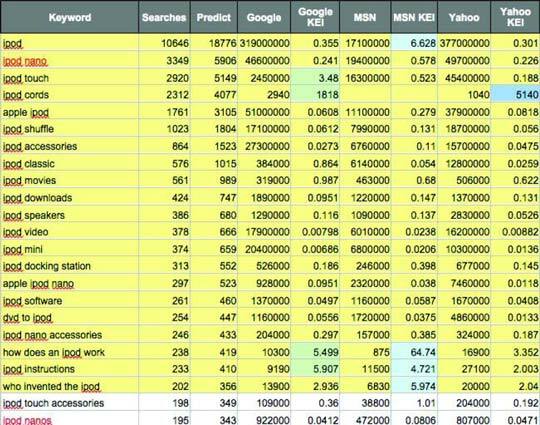 There are two ways to go about choosing what keywords to use in your site content: you can guess or you can analyze. Most companies with web sites employ the guess method. You MUST take the guesswork out of the equation. To win traffic you must persistently use analysis feedback. Following is a sample of research results on the keywords dealing with IPOD. Notice the huge difference in traffic between the keyword “ipod nano” and “ipod nanos.” Also notice the “ipods” does not even show up but “ipod” is at the top of the traffic column. If you had to choose one term – what would it be? Keywords can be categorized as Big Head words or Long Tail words. Big Head words are high traffic words that require deliberate and conscious effort to obtain ranking on. These are the words used to create titles, headers, meta tags, content, and generate external links. Long Tail words will naturally be searched because of the way you lay your content out. There isn’t as much traffic on these words as they are more specific. However, the aggregate of Long Tail words can represent substantial traffic. Building out inner pages based on Long Tail words will result in additional high purpose, targeted traffic. Here is a strong example of how long tail traffic can make a significant increase in traffic. This is based on the search term “Villancicos mp3s.” (Villancicos is a Spanish Christmas album). The #7 organic traffic driver to the above sample site was the keyword Villancicos mp3. Just a couple external links were enough to get the Villancicos page on the music site to the top Google ranking! There’s a tremendous amount of traffic on long tail artist names, album titles, and song titles. The music site is strongly positioned to get a lot of this traffic with some tweaks to the site. Density: The number of times a keyword/phrase occurs in the content. The suggested density is once for every 28 – 32 words of content. Prominence: Where the keywords are placed in the content. It is most effective to place keywords at the beginning of content paragraphs. HTML header tags ( <h1>,<h2><h3>, etc.) are more than a quick way to format text. Their most significant function should be to define your page’s organizational structure and simplify page navigation. Well-written header text enlightens visitors, helping them navigate through your site. Additionally, using targeted words in the header tags will increase your site ranking. Relevant header tags will even increase your site ranking on some search engines. Specifically, use the targeted keywords of the page as your header tag. On each product category main page set up H1 tags corresponding with the content of the page. By correctly anchor-texting your targeted big head words or categories you are giving weight to the words and giving the search engine a jump start in ranking these words in organic search. This shows the relevancy of your pages to search engines & helps rank for desired keywords. It anchors big head words and the primary value is navigation, but it also tips off and gives link weight to search engines. Google considers this practice important and relevant to rankings. You should anchor text words in your page content and via menus at the bottom of your pages. The main/index (home) page is the most influential real estate found on your site when it comes to anchor text. Using your keyword-dense content on the index and category pages allows you to link to inner pages. All words in your content that refer to other categories should be linked. This is a great method for pushing spider traffic while associating the keyword (anchor text) with the specific, relevant page being linked to. Links on inner pages are not as vital to search engine rankings as is the main page, having said that, inner linking is still an important component of your link strategy. Link inner pages between themselves and back to main category pages and the index page. Thanks for reading the article. If you also like this article like me please share the story. Also do not forget to comment me back.